St. Xavier's Jaipur is synonymous with world class education imparted in an exemplary and disciplined ambience. It has unrivaled contributions in shaping the intellectual facet of Jaipur, which we witness today. The legendary institution in its 68 years of glorious existence has nurtured many- be- it the younger ones of royals or the striving commoners. The sylvan 21 acres housing the stately three storied structure has showered love on generations and the Alumni of this prestigious institution stand as the bastions of the shimmering heritage and the historical Gold and Blue legacy. 'ROME NE S'EST FAITE EN UN JOUR' the celebrated 11th century French Proverb is brought alive as we trace the journey of the institution, the untiring efforts of our revered luminaries and their never ending quest for excellence. Above all, the benediction of God Almighty and blessing of our founder St. lgnatius de Loyola and of our beloved patron St. Francis Xavier has guided St Xavier's Jaipur to accomplish so much so fast. It all started in 1942 when Sir Mirza Ismail, the Dewan of Jaipur Darbar felt the compelling need to have a superior institution which can groom the upcoming generation of this historical Pink city with the best of education and values. It didn't take much of time to conceive that the city should have a Jesuit School. He then met Fr. Frank Loesch , SJ, the Superior of Patna and invited him to Jaipur. On hearing that the Jesuits are coming to Jaipur, Bishop Le Floch offered them the school by the name of St. Mary's which was started by Fr. Arthur and Fr. Ignatius at the Catholic Church Premises outside Ghat gate in July 1941. The school was facing challenges as Fr. Arthur had to leave for health reasons and within two years the location of St. Mary's was changed twice first to Purohit Dwarka Nathiji's place of Ajmer Road and later to Wali Gardens on Moti Doongri Road. Two Jesuits - Fr. William Hussey SJ and Fr. Robert Ludwing SJ were sent with the responsibility to recover. St Mary's and they finally took the reign in June 1943. Overwhelmed with the inception the Jaipur Darbar donated 12 acres of land in the then newly developed C-Scheme and the Jesuits purchased another 9 acres. The same year the school was rechristened as St. Xavier's School. There was no looking back after that the school grew steadily setting up unparalleled standards in education. The humble building erected initially soon grew insufficient to accommodate the growing number of students. A new building was planned and its construction began in 1950 the year is also glorified as it presented the first batch of students for the prestigious Senior Cambridge Examination. The new regal building was complete in 1952 and all the classes were shifted into it. The hostel, which already began in 1945, was also shifted there. Fr. Edward Mann SJ was head for this memorable period. In the year 1954 Fr. Albert Wilzbacher succeeded Fr. Mann. The governance of the State went through an overhaul with Royalty taking the backseat and the democratic government taking control but the popularity of St. Xavier's kept soaring. Even at times when the school's operation was under the scanner, no blemish was ever reflected which led to Mr. Mohanlal Sukhadia the Chief Minister of the newly ordained government, declaring it as a role model. Fr. Richard Periera SJ took over the office of the Principal in 1957. The new Hostel building, what we see as the Junior school block today was constructed in 1964 under the leadership of Fr. Joseph Willmes SJ and the boarders happily shifted to it. As the medium of instruction was always kept English, our boys were suave in debates and dramatics. Sports and games have always remained an integral part of Jusuit education worldwide and our boys carried on the indomitable sportsmanship both in games and in spirit. The Xavier's Cricket team under the mentorship of former Test player, Mr. N.D. Marshall, continued to win accolades at various state and national levels. A matchless basketball tradition was infused by Fr. Harry Berney, who literally gave his life for it. He died on the Basketball court in 1959! The contributions of Fr. Gerald P. Grace in shaping the Basetball forte as well as being an efficient school man in the liberal education tradition of the society and guiding the institution as a Rector for many years are beyond words. Fr. Pereira introduced excursions, which till today goes a long way in building the persona of the students and instilling confidence in them. By the time Fr. Periera completed his tenure in 1969, the school was alerady counted with the best boys schools in the country. The legendary journey is incomplete without the mention of the generous contributions of Fr. Casgrove SJ, Mr. S.N .Mishra, Pandit Hukum Narain and Mr. A .A. Sayeed. With a firm foundation, to shoulder the responsibility to explore yet newer heights, Fr. George Manjapilly took charge as the principal in 1970. His reign is remarkably known for the excellence achieved in the genre of academics especially modern sciences. For several years the school remained affiliated to both Indian School Certificate as well to CBSE, as the Central Board of Secondary Education till in 1975, retained its affiliation only to CBSE. Reverend Fr. Manjapilly was succeeded by Fr. N.V. Mani SJ in the year 1973, it was a period of introspection, in his own words 'this was the period when serious soul searching was going on in the Church as Well as the Society of Jesus, faced with socio economic tensions in the world, the Jesuits were challenged to reexamine all their services around the world. Who are the beneficiaries of our educational and other services? As followers of Jesus and his teachings shouldn't we give preference to the poor and more needy in all our efforts to serve? By some historical accident many of our educational institutions in India including St. Xavier's Jaipur appeared to cater predominantly to the affluent class! Thus the challenge we faced-and still face-was how to reconcile our 'preferential option for the poor' with the elitist structure of this school!" In 1979 the Patna Province Jesuits (to which Jaipur St. Xavier also belonged) decided to introduce some major changes as a consequence of this reappraisal. The medium of instruction was changed from English to Hindi, the hostel in the school was gradually phased out and finally in the year 1981, it become the Junior School Building. 25%of the admissions were reserved for the weaker sections of society. Balwadi was conceptualized to bring these children at par with the mainstream. The capital challenge was to mantain the standard of education with all these changes in place. Fr. Mathew Padyattay SJ carried the school subsequently through all these changes from the year 1983 to 1988, ensuring that the hiccups were minimized. Historically women leaders adjust better to changes; hence induction of SCJM Sisters to manage the Junior School was a welcome step in the year 1986. The wave of changes continued and in the historical year 1989 the school was made a co-educational school inducting girls in standard I. The goal defined by reverend Fr. N.V. Mani SJ on the auspicious occasion of Golden Jubilee in the year 1992 states, "As we celebrate the Golden Jubilee we continue to search for ways and means to operationalize our vision of a just and fair educational service adapted to the needs and aspirations of the ambient community." Fr. P.T Augustine held the leadership in1994 and encouraged students to excel in academic and co-academic areas equally. This was the time when students become highly career consious because of the rising competition in the outside world. Students were seen flocking to IIT and PMT classes after school. This bug didn't leave St. Xaviers unsmitten it was then that Fr. Augustine emphasized on modeling teaching in senior classes so the rush of students haywire could be mitigated. The school produced, highest in the state, admission in IIT then. Fr. Jose Philip SJ took over the leadership in 1997 and continued the journey for 10 years. The middle school block was built during his tenure. For the better administration of the school he felt the need of decentralization and thus a post of the vice principal was created exclusively for the supervision and monitoring of middle school section. He was totally against corporal punishment and believed in persuasive measure. He gave utmost importance to sports and encouraged students to take active part in various sports disciplines. The journey continued with the able leadership of Fr. 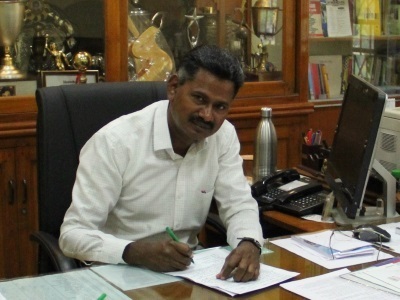 Jose Jacob, SJ who presently is the principal of St. Xavier's School, Delhi. St. Xavier's College was set up with the untiring efforts of Fr. Varkey Perekkatt, SJ, the Provincial and the unflinching support of the Principal, Fr. John Ravi, SJ who is reputably recognized for his affable nature and quick decision making. The school is forging ahead with Continuous and Comprehensive Evaluation taking the forefront. Rote learning will inevitably be discouraged and independent thinking and personality development remain as the motto of our modern education system. Fr. Glenn Menezes, SJ, the Rector of St. Xavier s School and College has steered St. Xavier's Jaipur to greater heights and continues to render his dedicated services, always willing to take up bigger challenges which lie ahead. Cheers for Xavier's !